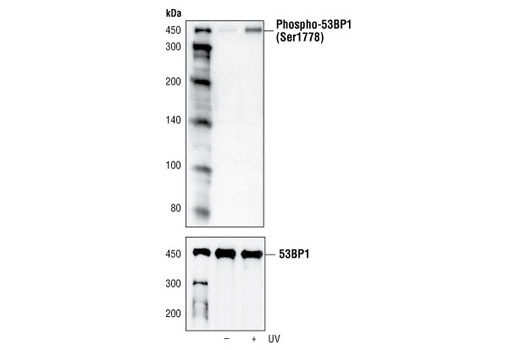 Western blot analysis of extracts from 293 cells, untreated or UV-treated (50 mJ for 2 hours), using Phospho-53BP1 (Ser1778) Antibody (upper) or 53BP1 Antibody #4937 (lower). 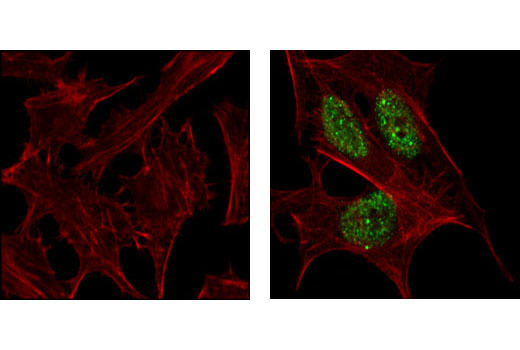 Confocal immunofluorescent analysis of HeLa cells, untreated (left) or UV-treated (right), using Phospho-53BP1 (Ser1778) Antibody (green). Actin filaments have been labeled with Alexa Fluor® 555 phalloidin (red). Flow cytometric analysis of HeLa cells, untreated (blue) or UV-treated (green), using Phospho-53BP1 (Ser1778) Antibody compared with a nonspecific negative control antibody (red). 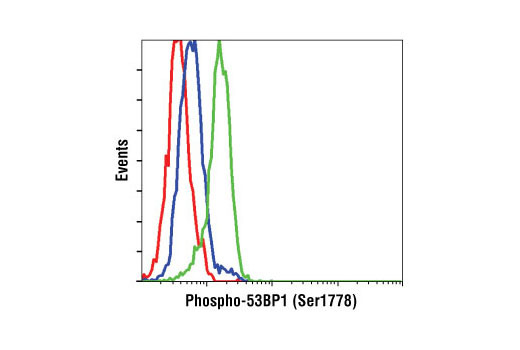 Phospho-53BP1 (Ser1778) Antibody detects endogenous levels of 53BP1 only when phosphorylated at serine 1778. Polyclonal antibodies are produced by immunizing animals with a synthetic phosphopeptide corresponding to residues surrounding Ser1778 of human 53BP1. Antibodies are purified by protein A and peptide affinity chromatography. Within the first BRCT domain (amino acids 1714-1850), there exists a consensus ATM/ATR phosphorylation site, Ser1778. It is conceivable that phosphorylation of Ser1778 could therefore serve to regulate 53BP1-p53 binding.